In this the 50th year of Voice of the People in Uptown, our organization is strategically planning for another fifty years. We are inviting neighbors and representatives to provide positive input and guidance. Voice is a non-profit corporation controlled by its low-income and working class residents, as well as supportive community people, professionals and peers that comprise its advisors and board. It has been a long-time developer and provider of affordable leased and ownership housing, and facilitated the creation and preservation of housing throughout Uptown with other organizations. Voice of the People is listening. 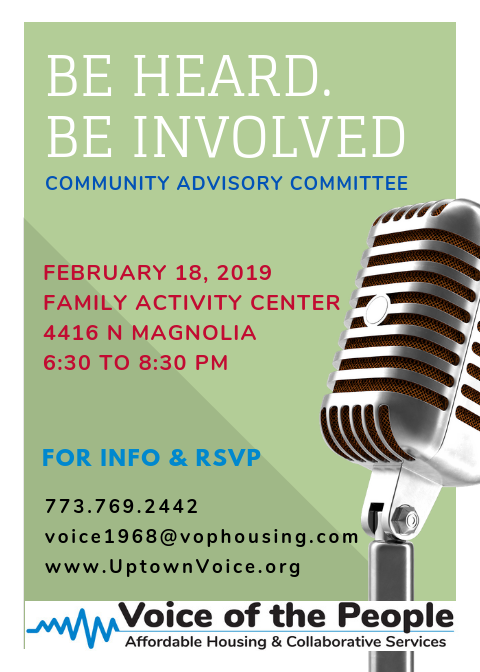 The Community Advisory Committee will seek to raise awareness about Voice of the People, while enlisting guidance about current and planned efforts in property management, resident services and collaborations with area service providers. In this process, the organization is reaching out to property owners and business who want to extend housing and economic opportunities to residents of a diverse, mixed income Uptown. Follow us on Facebook. Call or Contact Voice regarding your interest or to recommend others who may wish to participate.